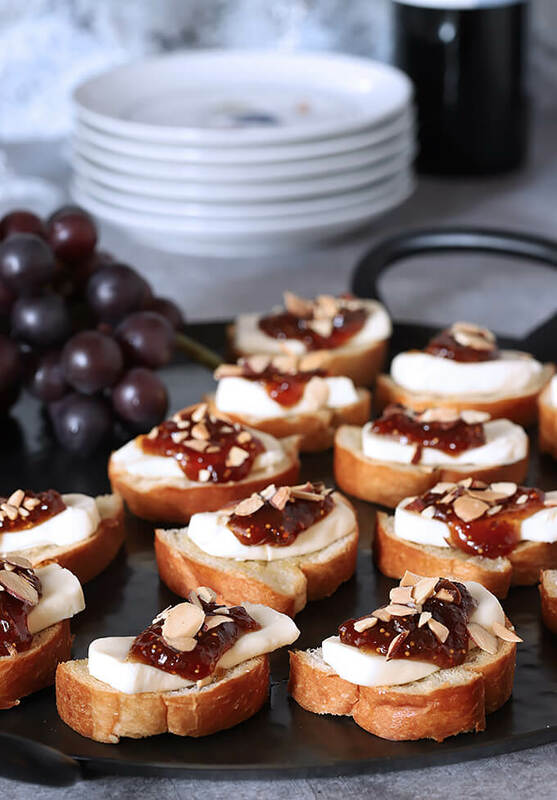 Great appetizers do not have to be complicated and this Fig Jam and Brie Crostini Appetizer is the perfect example. Perfect for small or large gatherings, it’s quick and easy and absolutely delicious. This is the first of many appetizers I plan to be making the next couple of months; I hope you love them as much as I do. And you would never know I love them as few as I’ve included in this blog! I’m not sure why; maybe because I really do make them for parties and often there is simply no way I can add photography to the list of things to get done when I’m having a party. So I’m going to make an effort to share some old favorites and make some new as we head into the season of get togethers. My neighbors were the beneficiaries last night; I’m sure they won’t mind if I make more than one person can eat; I put out the word and three people showed up with plates in hand…win win I say; the next day they just are not the same! I’ll be honest I had to really take a leap of faith one day as a grownup to even try fig jam. I was not the most picky eater as a kid; I hated green peppers, liver (WHY?) and…Fig Newtons. When I would see them brought to the table as the dessert offering I wanted to cry. I had a terrible sweet tooth and I LOVED dessert but I just despised those cookies. I felt like my mother must hate me to serve them for a quick dessert. So it took me awhile. I’m over it; I’ll probably never like Fig Newtons but I sure love all things fig and this month fig is the theme of our Progressive Eats group. I actually had BIG plans. I’m not sure what they were, but I searched for and found a package of figs. Pretty pricey little puppies here at the base of the Rocky Mountains but I splurged. The next day I opened the package and doggone it…moldy. Ugh. So I decided to punt and without fresh figs on hand after all moved next to the jar of fig jam I had been given as a gift. This time I had everything on hand and it really was so simple. The bread is cut and dabbed with some olive oil and baked and then slices of Brie are next topped with a small spoonful of fig jam and toasted, sliced almonds. See, I said it was easy. And everyone loved them. Isn’t that the perfect combination? So give these a try; they are a great appetizer for a family get together or a holiday party; the perfect blend of sweet and savory and oh so easy. That’s the part I think I love the best. 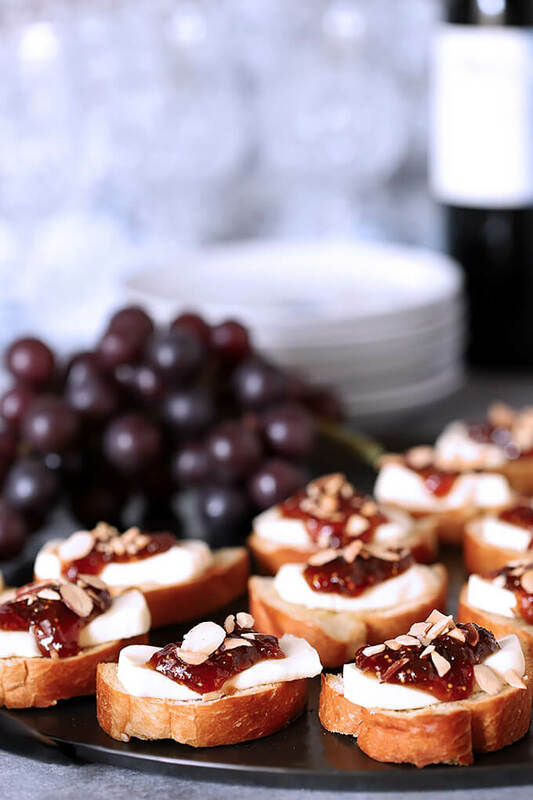 Also, be sure to check out all of the delicious recipes for our Fig Fête from my talented friends that are listed below; from Cocktails to Desserts, we’ve got you covered. If you’re unfamiliar with the concept, a progressive dinner involves going from house to house, enjoying a different course at each location. With Progressive Eats it’s a virtual party. A theme is chosen each month, members share recipes suitable for a delicious meal or party, and you can hop from blog to blog to check them out. Come along and see all of the delicious dishes featuring figs! Preheat oven to 400F, with rack in the middle of the oven. Place baguette slices in a single layer on a large baking sheet. Pour the olive oil into a small bowl and use a pastry brush to dab it on both sides of the baguette slices. Bake 4 minutes and flip slices over; continue baking for another 4 minutes until the slices are crispy. Top with slices of brie and return to the oven just long enough to soften the cheese but not have it melt; about 1-2 minutes. 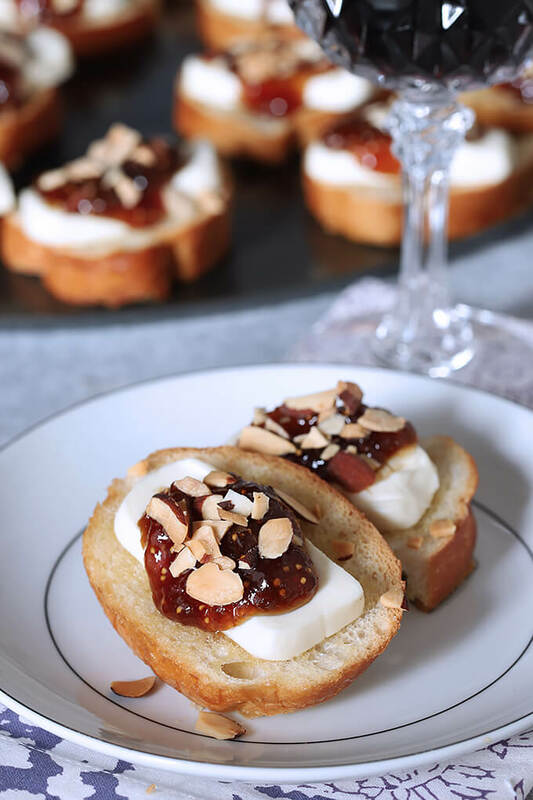 Top each crostini with a generous dollop of fig preserves and sprinkle them with the chopped, toasted almonds. Serve. I can’t think of a better combination than fig jam and brie!! This sounds amazing and I can’t wait to try it. It’s a lovely combination and such an easy appetizer to make…win win right? Happy Holidays! I hope you love them too; the best part might be that they are SO easy! These are so simple, but they look so delicious! Thank you for this recipe! They are both; sort of the perfect appetizer! Love these little morsels. And tonight, they’ll be perfect with the several glasses of wine I have to drink just to listen to the news. Or maybe I won’t (listen to the news) and I’ll just eat these while sipping my wine. Either way, my appetizer satisfaction is assured. I think we need a bottle of wine. Each. And a whole tray of these. Come join me. Times like this I wish all my soul sisters could actually convene…and commiserate. Or rejoice. We need rejoicing!! I love how simple these are to put together, perfect for impromptu parties and gatherings! They remind me of snacks we put together in Paris! Those are gorgeous!! Perfect for a large gathering! Loving the toasted almonds on top too. Thanks Karen; they are so perfect for a lot of people when having some appetizers that are easy to put together really helps. Those are my kind of apps ALL the time! Figs are great! And they make a terrific jam. I love appetizers like this, and actually make something a bit similar. This one is terrific — I need to make this one, too. 🙂 Glad to learn we’re going to see a bunch of appetizers from you over the next few months — we love ’em and are always looking for new ideas.